Developers and entrepreneurs can now leverage real-time road events data to build commercial apps and online services to inform travellers of potential travel delays. 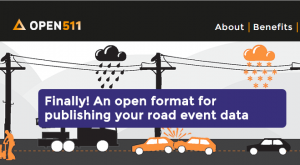 The Ministry of Transportation and Infrastructure has published DriveBC Open511, an Application Programming Interface (API) for road events data for provincially managed highways, including planned construction, accidents and extreme weather conditions. This is the data behind the extremely popular service DriveBC. Available for commercial use under the Open Government License (OGL)– British Columbia, this data is a great opportunity for entrepreneurs and developers. Whether a commuter or a truck driver moving goods, travellers want to save time on the road. As the old adage goes, time is money. We think apps that notify travellers of delays so they can take alternative routes would have real value for travellers in the province. The Government of B.C. invests in highways and roads to move British Columbians and goods efficiently around the province. We want to see the B.C. tech sector build apps that makes our roads even more efficient. This could make a real impact in the daily lives of British Columbians. Collectively, time saved on the road could boost the productivity of the provincial economy. An opportunity for us and our transportation partners to work together in a consistent way, sharing data with each other and the public to better deliver services. By sharing this as open data via an API, developers can innovate and make the data more readily available to those we collaborate with to deliver transportation services. Publishing DriveBC’s data under the Open511 data standard strengthens the future commercial potential for app developers. Led by the non-profit OpenNorth, the development of Open511 looks to emulate the success of other standard data formats like the General Transit Feed Specification (GTFS), the widely adopted standard for transit data developed by Google and the City of Portland. Transit authorities around the world now serve out their data following the GTFS, making it possible to build apps that serve markets from London to Los Angeles. If more governments adopt the Open511 standard, the same code for an app built for the B.C. market could scale to new markets too. The power in Open511 is when multiple transportation jurisdictions from all levels of government share their road events data using the same standard. To achieve the desired outcome of seamless road event information, we want other jurisdictions – including municipal governments in B.C. – to adopt the standard. If you work for a transportation agency or municipal government and are interested in sharing your road event data under the Open511 standard, let us know how we can help. Whether it would be helpful to understand policies, data management practices, or technologies, we are happy to have in depth discussions and share our experiences and knowledge. Let us know your ideas for participating or any questions you have in the comments below or contact us by email. Are you an innovative programmer? If you are interested in creating innovative tools and services that help road travellers, check out our Open511 implementation. You may also be interested in exploring the API through an experimental console set up by the BCDevExchange. Get creative and have some fun, we look forward to seeing our data integrated into your websites and applications. When you work your way around the API let us know what you think? We welcome your feedback on how we can make the service better for you.